Complex and beautiful patterns adorn the icy surface of Jupiter's moon Europa, as seen in this color image intended to approximate how the satellite might appear to the human eye. The data used to create this view were acquired by NASA's Galileo spacecraft in 1995 and 1998. 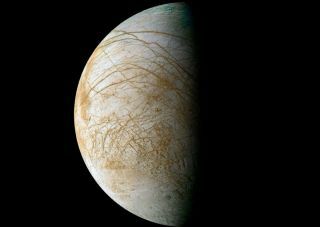 Missions hoping to explore the huge subsurface ocean thought to exist on Jupiter's moon Europa may have to dig deep — really deep. Water stays in a liquid state near Europa's surface for just a few tens of thousands of years or so, new research suggests. That's a blink of an eye in geological terms, since our solar system is more than 4.5 billion years old. "A global water ocean may be present, but relatively deep below the surface — around 25 to 50 kilometers," Klára Kalousová, of France's University of Nantes and Charles University in Prague, said in a statement today (Sept 24). Many researchers think Europa, which is about 1,900 miles (3,100 km) wide, harbors an enormous global ocean beneath its shell of ice. While Europa's surface is frigid, heat generated in the moon's interior by Jupiter's gravitational pull keeps this ocean — which may be 60 miles (100 km) deep — from freezing solid. Here on Earth, life thrives wherever liquid water is found. So Europa is an intriguing target for future missions seeking signs of life elsewhere in the solar system. But scientists don't know how difficult it would be for a future Europa probe to access the moon's ocean, because they're not sure how deep beneath the crust it lies. Some researchers have speculated that pockets of liquid water may persist just a few miles below the surface, but the new study throws cold water on that prospect. Water near Europa’s surface migrates downwards toward an ocean. Kalousová mathematically modeled how mixtures of liquid water and solid ice behave in a variety of conditions. She found that differences in density and viscosity, along with several other factors, probably cause water near Europa's surface to migrate downward rapidly through partially melted ice to meet up with the larger ocean. Europa isn't the only moon in the solar system that may have an underground ocean. Fellow Jovian moons Callisto and Ganymede might have one, for example, and so might Saturn's icy satellite Enceladus. The new study could help scientists better understand these frigid worlds, as well as Saturn's huge moon Titan, which has a hydrocarbon-based weather system, Kalousová said. "As well as helping us to better understand Europa’s water cycle, this research could provide insight into icy moons that are geologically active, such as Enceladus, and worlds that have cycles connecting the interior with a surface atmosphere, such as Titan," she said. Kalousová will present the research at the European Planetary Science Congress in Madrid on Tuesday (Sept. 25).